Pieratt No. 725 had a dedication of their new Temple on Saturday, November 28, 2015. 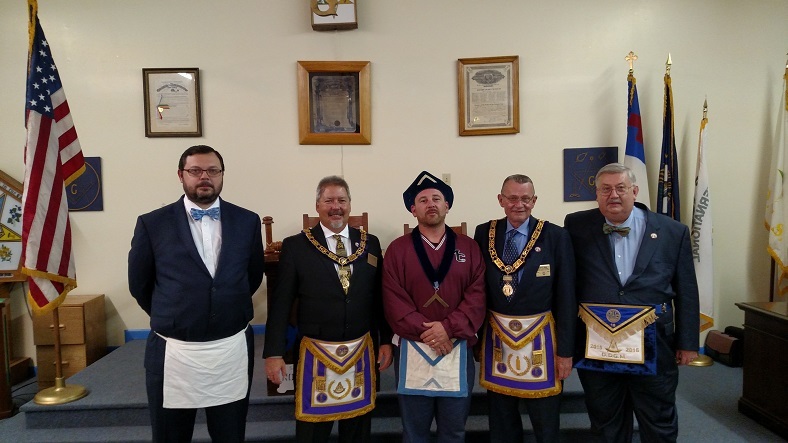 The dedication ceremonies were conducted by the Most Worshipful Grand Master of Masons in Kentucky Cloyd Bumgardner, Right Worshipful Deputy Grand Master Todd Jones, Right Worshipful Grand Senior Warden Tim Sanders, and Right Worshipful Grand Junior Warden Gary Rose. Many other Grand Lodge representatives were present including appointed Grand Lodge Officers, District Deputy Grand Masters, and Grand Lodge Committeemen. We all enjoyed a great meal provided by the Brothers of Pieratt No. 725 prior to the dedication ceremony. We want to wish the Brothers of Pieratt No. 725 many years of success as they begin building new memories in their new Temple. 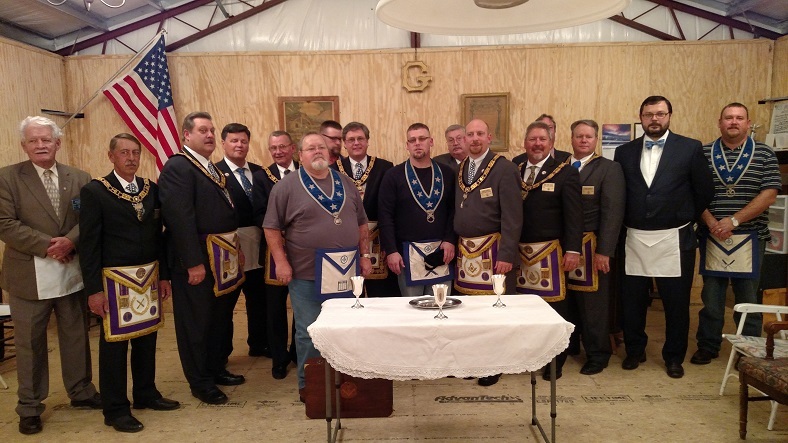 While enjoying a very relaxing Thanksgiving getaway in eastern Kentucky, Brothers Dan Kemble, District Deputy Grand Master, District 18, Grand Lodge of Kentucky; and Adam Gross, P.M., took the opportunity to visit the Brothers of Salyersville No. 769. Upon hearing that we would be in town, Right Worshipful Deputy Grand Master Todd Jones and Right Worshipful Grand Junior Warden Gary Rose also attended. Worshipful Master Brad Blair welcomed all of his visitors for the evening and made us feel right at home. Salyersville No. 769 has a lengthy list of community programs currently in place and are adding to it. The Brothers of this Lodge are working extremely hard to show their community who we are, what we do, and that Masonry Matters. If you ever have the opportunity to visit the Brothers of Salyersville No. 769 (on the 2nd and 4th Friday of each month at 7:00 PM) you’ll have a great time, I guarantee it. 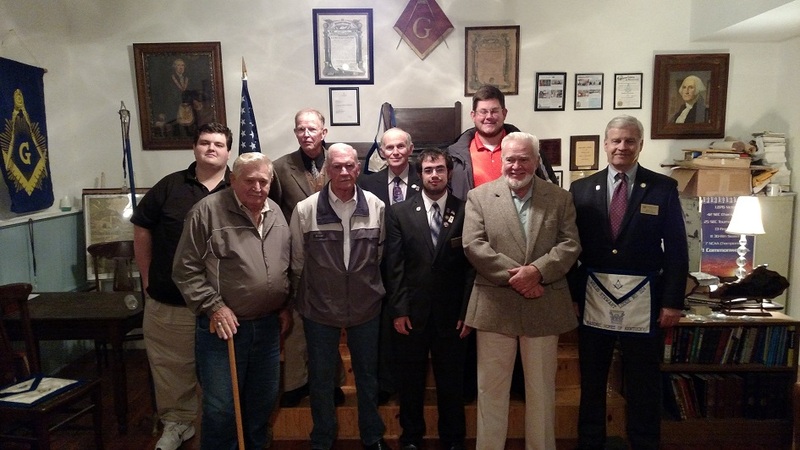 At our stated meeting on November 10, 2015, our Lodge was honored to welcome eight visiting Brothers representing four different Lodges. Our guests enjoyed a fine chili supper prepared by our own Bro. Buddy Wallace, P.M. Each of our guests made very gracious remarks to the Lodge upon introduction. We are delighted to welcome visitors to all of our meetings at Elvin E. Helms Lodge No. 926. We hope you feel at home in our Lodge and visit us often! Bro. Bruce Lott, Vice President for Fraternal Relations and Planned Giving of the Masonic Homes of Kentucky, and a Past Master of Willis Stewart Lodge No. 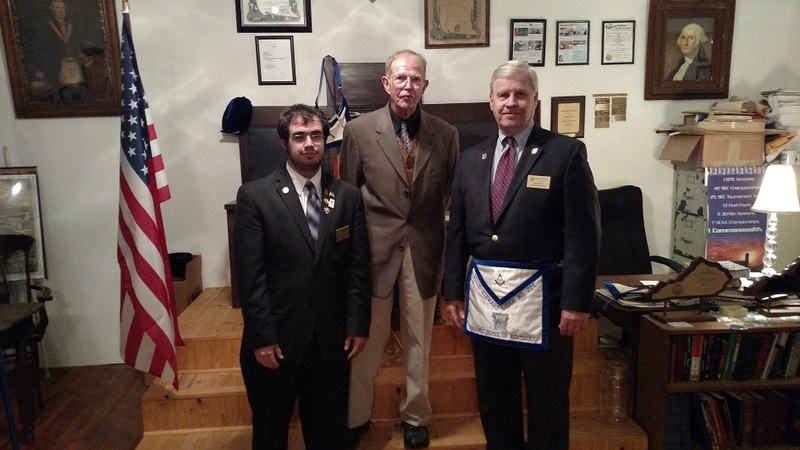 224, Louisville, Kentucky, presented our Lodge’s educational program at our stated meeting on November 10, 2015. Bro. Bruce gave an overview of the history of the homes, the services that they now provide and the basics of the Masonicare Program. Bro. Bruce also spoke about the possibility of new regional services to be offered by the Masonic Homes of Kentucky. Bro. Bruce invited the craft present to visit the Homes whenever possible, and asked the Lodge to consider adopting a resident of the homes by remembering that person on holidays, birthdays, and intermittently throughout the year. Bro. Bruce’s presentation was very informative and well received by all present. At the conclusion of our meeting, our Lodge voted to donate $ 200 to the Masonicare Program. Please remember to support the Masonic Homes of Kentucky! Pictured are Bro. John Dettor, P.M., Golden Rule-Covington Lodge No. 109, District 18 Ambassador for the Masonic Homes of Kentucky, Bro. Ernie Stratton, P.M., Acting Master of Elvin E. Helms Lodge No. 926 and Bro. Bruce Lott, P.M., Willis Stewart Lodge No. 224, Vice President for Fraternal Relations and Planned Giving of the Masonic Homes of Kentucky. Pictured above, left to right, are: Bro. Marvin Knorr III, Boone-Union Lodge No. 304; Bro. Tom Roundtree, P.M., Latonia Lodge No. 746; Bro. Ernie Stratton, P.M., acting Master of Elvin E. Helms Lodge No. 926; Bro. Vern Gregory, P.M., Latonia Lodge No. 746; Bro. Bill Dettor, P.M., Golden Rule-Covington Lodge No. 109 (and an honorary member of Elvin E. Helms Lodge No. 926); Bro. John Dettor, P.M., Golden Rule-Covington Lodge No. 109 and current Ambassador for the Masonic Homes of Kentucky for District 18, Bro. Brad Drew, Senior Warden of Latonia Lodge No. 746; Bro. Chuck Yocom, P.M., Jr. Warden of Latonia Lodge No. 746 and Bro. Bruce Lott, P.M., Willis Stewart Lodge No. 224 and Vice President for Fraternal Relations and Planned Giving of the Masonic Homes of Kentucky. While traveling in Virginia, Brother Adam Gross had the pleasure of meeting Brother Eric LeHew. Brother LeHew is an educator. He brought to Lodge with him that evening a plea for assistance on behalf of a co-worker and fellow educator originally from Kentucky who also has Masonic connections to our great Commonwealth. He was assured that this plea from Liz Meitzler would be shared with Brother Masons back home in Kentucky. Click here to visit the GoFundMe page for more information. My name is Liz. I’m a public high school ESOL teacher in Virginia. This past year, I made one of the most difficult, and rewarding, decisions of my life. I took guardianship of an amazing young man. Becoming the single parent of a 17 year old has not been the easiest thing, but we have quickly become family. I’m his mom, and I wouldn’t have it any other way. However, we have had an unexpected surprise. While investigating some of the first real medical care he’s ever received, we found a rather large dental problem. An $18,000 dental problem. While in his country he had a few cavities, apparently the solution for any dental decay in his region is extraction. Six of his teeth were pulled, when they only needed fillings. We’ve worked closely with an amazing dental firm, and they have been extremely generous with us, but implants, especially so many, are extremely costly. He’s my child, and I am putting the expenses on credit cards and anything I can find space on. We’re still working on legal fees and the like, but as most can probably imagine, my salary doesn’t really compensate for this kind of surprise medical expense. I want to do the best I can for Fernando, and will support him in every way possible. He’s the best thing that has ever happened to me and my only regret is we did not find each other sooner in life. He’s a wonderful, intelligent young man with infinite potential and as I said, I just want to do the best I can for him. I don’t have expectations of raising the whole cost. It’s a huge amount of money and I fully expect that I will be working on paying it off for a long time to come, but I wanted a platform for anyone who might want to help to participate. 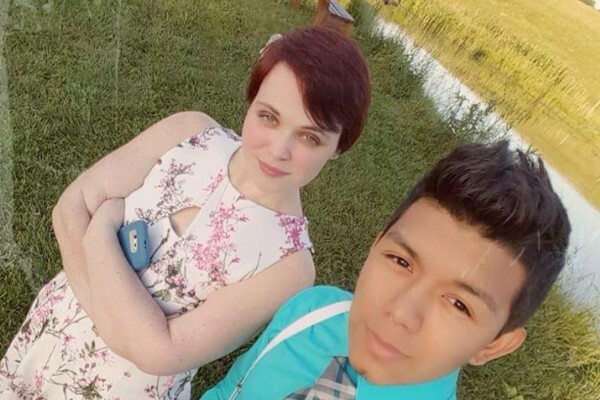 Please, anything that you may be willing to give to help me support this amazing young man will be so deeply appreciated by our little family. Please click here to visit the GoFundMe page Liz has setup to help Fernando.